I guess we’ll have to change the Wikipedia definition — or maybe he did already. Just looked at Wikipedia…their definition(s) look right to me. Krueger is (half) wrong. 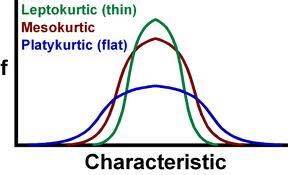 Compared to a normal distribution with the same variance, a distribution with high kurtosis will have fatter tails *and* a sharper peak in the middle, so less mass around 1 std. dev. from the mean. We could salvage Krueger’s statement if he said that the variance *and* kurtosis had increased. This is what happens if you simply move mass from the center to the tails. Of course the income distribution is highly asymmetric, Krueger could probably also have said that the skewness is increasing.